Unbelievable. That old tale about VMware adding an extra layer is still being told in the Microsoft Virtualization Comparison Brochure. [Update: The document was pulled by Microsoft and slightly modified as a result of this article.] Pretty surprising, and not at all honest — using the term layer implies a particular order or hierarchy, not merely quantity. And what on earth is the virtualization layer doing on top of applications? 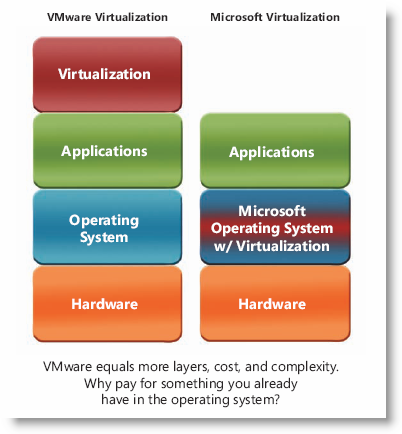 The case Microsoft is really trying to make here is that if you don’t have VMware virtualization, then you don’t have VMware. True enough, I suppose. But you still have the same number of layers. 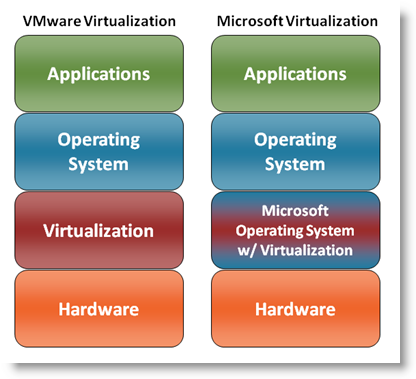 I took the liberty of making some corrections to the Microsoft collateral and am pleased to present three more appropriate ways to depict these virtualization layers. Nothing surprising there — that is how any truly technical content would describe the arrangement. 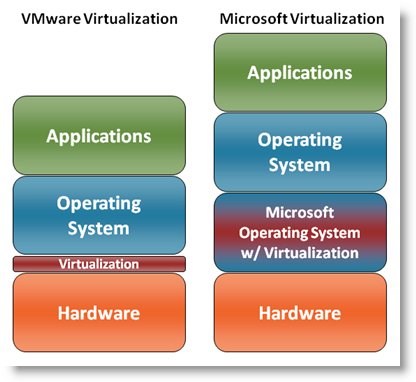 Notice that virtualization is actually not above the application layer. As long as the hypervisor is not tied to a general-purpose operating system, this makes good sense. However, since Hyper-V is merely a role in Windows Server, it would be a real stretch to picture the same combination for Microsoft virtualization. Now that I’ve reasoned it through, maybe three layers isn’t so bad after all. How do you like them layers? Did someone actually type up that MS comparison PDF with a straight face? Forklift upgrade? Oh, and of course the touting of live migration INCLUDED when didn’t MS say no one needed live migration? The last thing I need is a MS OS under the virtualization layer that needs patches for IE or a patch to allow other patches to be applied. I would say, Hyper-V has an *additional* Layer, the general propose OS layer, which needs to be patched and managed just like any Windows Server OS. This OS carries all the Windows heritage, and has lots of remains of Windows 3.11 for ex (registry/Disk defrag/Security problems/Driver issues/DLL hell, etc) . MS is hopeing you don’t know any better so they play the FUD war and add conflicting and confusing information and hope you don’t know any different. Unforuntally for MS is that we already know and understand the difference and choose vmware over updating every Tuesday and wondering if this update will blue screen the server. Thanks for making it easy choice MS! Nice post, Eric. I agree with your points above, but am really curious if it matters how the boxes line up? Sure, there are host considerations – but as to where the squares fall? I think it becomes a series of academic and religious discussions after a bit. Since Microsoft can take the liberty of describing all of VMware’s products simply as VMware, then we are free to assume that they are comparing against VMware Server or VMware Workstation or VMware Fusion. Even then it makes little sense. It makes no sense however, when you say VMware ESX. I’ll bet Microsoft’s original chart above is assuming the use of VMware Server instead of VMware ESX. >Microsoft solutions offer comparable or even better functionality at much less cost? Better functionalities!? Can anyone tell me which one!? The Picture is stupid… but the Message Hyper-V is a additional layer? No Virtualization is a new job for a operating system. VMware build his on OS, Microsoft has added this to there OS and this OS is proven as well on millions of systems.. I know this blog is the vmware friends blog.. and i’m on the other side.. but as i remember the fight you don’t win with the best techology you win with focus on customer needs and offer solutions. You all running with i high % Windows Workloads on your platform… because this is bad?? Yes you can compare the products on their technical merits and many people will come to the conclusion that Hyper-V meets their needs that’s good, that is freedom of choice. The issue many people have is they see Windows (and therfore Microsoft) as a necessary evil all of these years because of the desktop OS monopoly. What if they do to Vmware what they did to Novell, do you think Hyper-V will be ‘free’ then? Hardly, and history tells us so. Eric – I respect the community you’ve built here (and I’m a Microsoftie). Lots of passion, loyalty and enthusiasm for VMware’s point of view. I’ve seen that at the last 7 VMworld conferences from our booth and I see it online here and elsewhere. That said, there are 2 sides to a coin. VMware’s point of view is just that – a point of view. Sometimes right, and sometimes wrong. We made an error on the diagram. I expect you’ll see our diagram corrected within a week – where VMware Virt layer is between HW and OS. Bad editing on our part. We still have the point of view that VMware software adds another (very expensive) layer of software in the datacenter, creating a virtual island in the datacenter. I know we’re not the only vendor with that point of view. I don’t expect you/your community to agree. Patrick, thanks for acknowledging the error. However, continued use of “VMware is an extra layer” is still dishonest and takes advantage of innocent customers that don’t know any better. For those even slightly educated in virtualization, this is obvious FUD. I hope Microsoft seriously reconsiders this line of attack. Anyway – Regarding the comment of Markus. Also imagine – Novell had may the better products. But the customer went to Windows Server’s Active Directory. Could this happen again with ESX and Hyper-V? By just repeating the MS marketing stuff, you will not indeed convince anyone. Why not do you show us why a 60MB Hypervisor is an additional layer, and a full install OS with all the required management is not ? I don’t think you need to adopt VMware’s point of view to objectively compare the approach between them and Microsoft/Hyper-V and find obvious “flaws” in Microsoft’s reasoning. It is good to see that the “VMware Comparison Kit” has been taken down – ostensibly to correct false or misleading claims – but Microsoft needs to be careful about what ground it claims as its own. It is not necessary for Microsoft Hyper-V to play the my-layer-is-better-than-yours game anyway. Look to Red Hat and KVM – another approach tied to an OS or OS-lite. VMware’s ESX is – with its management console and third-party driver facilities – still tied to an OS-lite approach. However, VMware ESXi – which appears to be heavily compared to Hyper-V due to “cost” reasons in the marketing – is not OS-lite. For the mythical SMB with a penchant for 8-CPU servers as the virtualization platform (in an industry where 2-CPU is dominant with 4-CPU far behind) this is an absurd comparison at that level. Add to that, the fact that initial consolidation/migration will be based on existing licensed footprints and the “comparison math” needs a bit of work. Also, Microsoft should be careful calling overcommitment “bad” based on VMware performance best practice guidance. Since Microsoft’s license comparison has Enterprise Plus in the mix (for maximum financial effect? ), DRS should be accounted for in that scenario. Given the strata of virtualization workloads, memory overcommitment and page sharing will deliver VM/host gains WITHOUT encountering the performance issues warned about in VMware’s best practice guide. For that matter, the same functionality could be had in Enterprise (not plus) for $800/socket less money… it also neutralizes much of the Windows licensing differences. Dropping to 2-CPU platforms does some additional damage to the model. That said, why does Hyper-V get compared to Enterprise Plus in the first place? Hyper-V has no vNDS or fault-tolerance facilities. While PRO features provide similar functionality to VMware’s DRS, Hyper-V’s feature stack is more like vSphere Advanced with DRS-like features. Certainly Quick Storage Migration cannot be compared Storage vMotion, and PRO doesn’t appear to have DPM capabilities (yet?). That drops the comparison another $800/socket in implementations where DRS/DPM are not key factors. As a VMware user and employee of a VMware partner, I’ve been asking for vMotion to be a “standard” feature in all of VMware’s line-up. As a differentiator within the VMware SKU’s, I fear it’s not long for this world. Live migration is certainly a large benefit for R2 versus VMware “standard” but I’m a bit more comfortable with NFS and VMFS than I am a general purpose “clustered” file system, Microsoft Failover Cluster Services (16-node limit), or the hoops associated with configuring Hyper-V for live migration. Hey, I’m not here to bash Hyper-V or any other competitor to VMware – we’re researching what Red Hat/KVM will do to the market right now. The Microsoft tactic reminds me of recent threads about the correct approach to product marketing and avoiding the bashing technique. Hyper-V will have its use cases and VMware will adjust product and/or marketing to remain competitive there – if not, VMware will see the beginning of the end. I think that VMware Solution are similar to Misrosoft one (on a layer perspective, not performance 🙂 ). Microsoft is true in his pdf if compare hyper-v to vmware workstation not to esx. The affirmation tha esx has small footprint is true only in esxi, esx is not so small. If I remember correctly esx/esxi are based on Red Hat kernel, so linux based hypervisor. We have at the end windows 2008 based hypervisor vs linux based hypervisor. The correct layout for me is Hardware / OS based hypervisor (lite or not) / Virtualized OS / Apps. I just sat through 45 minutes of a Microsoft presentation where they mentioned this extra layer and it basically turned into 45 minutes of the Microsoft rep ranting about VMware and pointing out how terrible it was and how wonderful Hyper-V is. As I haven’t used Hyper-V I can’t comment on its capabilities yet, but I was offended that they wasted 45 minutes of my life for a propaganda campaign against VMware. I should mention the comparisons of Hyper-V R2 were compared against ESXi 3.5. This hardly seems objective. To me it looks like you’re mixing ESX and ESXi with Hyper-V Server and Windows 2008 with the Hyper-V role and taking the best from either ESX version to make the W2K8+Hyper-V Role look bad. Also, VMWare is not above FUD, seems the VMWare fanbois have already forgotten the you-tube incident? sj: Please do not let Microsoft mislead you into thinking that there is any notable difference between Hyper-V Server and Windows 2008 + Hyper-V. Architecturally, they are equivalent. The same cannot be said about ESX and ESXi. The only thing I had to do to make Hyper-V “look bad” was shine a light on an actual Microsoft competitive sales brochure. Sad, but true. Eric, I assume you’ve seen that Microsoft has redrawn its VMware diagram so that it’s identical to your “Objective Comparison”? Steve, I have not seen that but it would be nice. Last time I checked they were still missing a layer on the Microsoft stack. That particular document is essentially anti-VMware FUD for business people, not techies. All of the Microsoft documentation geared for technical audiences correctly accounts for the additional guest OS instances. 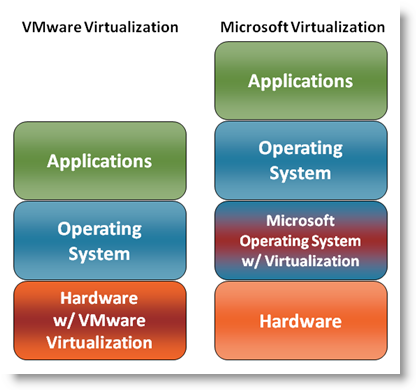 Omitting the guest OS and calling the whole thing “Microsoft OS w/Virtualization” is simply a lie. By the way, Microsoft, where does the much-hyped Linux guest support fit in to that three-layer fantasy? Eric, the revised drawing is on the November, 2009 doc posted on http://www.microsoft.com/vmwarecompare. Unfortunately, the Microsoft stack is still missing a layer. Let’s call it a partial victory for truth. Am I missing something ? I still see the very same dishonestly, and MS insisting VMware is an additional layer. Fernando, you are not missing anything. Evidently, the end (preserving the monopoly) justifies the means (lies). I compared whole virtual infrastructure cost for vSphere and Hyper-V, including servers and all licenses. Interesting results – in some cases “free” Hyper-V costs 10% more than overpriced vSphere Enterprise Plus. Anton, thanks a lot. It’s a really impressive work ! OK, so yes, MS screwed up on the marketing. What else is new? However, it is only screwed up when you look at it strictly from the architecture view point. As is almost ALWAYS the case with MS, most of their marketing is aimed at one thing: licensing costs. They often are only telling the licensing costs story. And, in that case, that “missing layer” is accurate. The point of that corrected slide (showing the virtulization layer in the right spot) is really aimed at saying “with MS, you don’t have to pay for all of those additional windows licenses.” Even that is now a different story, since MS allows you to buy the datacenter license on any hyper-visor. So, as long as we are not talking about the “free” hyper-visor versions of VMWare and MS, then you do have an extra layer in VMWare that does not exist in MS: additional OS you have to buy, as the Hyper-Visor comes with the MS OS. As for the cost analysis, I have done plenty of those. My favorite slide in the world to poke fun at is the MS slide that shows a 5 host configuration that costs $60K for VMWare and only $20K for MS. HA!!!! When we ran the real numbers, and looked at all of the Datacenter editions both for Windows and System Center (the whole suite), it is real world closer to $25K for VMWare and about $21K for MS. Pretty close to even in my book. Add SAN, storage and networking. Would be closer to $225k and $221k. Excellent post! Microsoft really can’t approach the thinness of VMware ESX virtualization. It’s a shame that the FUD that M$ spreads is so effective. To your point about whether virtualization is hardware or software, it really depends on your vantage point. From above (viewing from the client OS) it appears to be hardware. From below (at the hardware layer) it appears to be software. It really is both. Either way, the virtualization layer should be optimized for one purpose: to facilitate the servicing of client requests. Microsoft’s solution is much too big and fat for that purpose. Perhaps, in time, they’ll revisit their kernel and build a real virtualization kernel. Right now, it’s just a kludge that tries to push a general-purpose operation system into the role of a virtualization I/O tool. Leave it to Microsoft to repurpose their same bloated kernel again and again.